The Near North Side is one of the four areas that constitute downtown Chicago. The others being the Near West Side, Near South Side, and the Loop. All are located south of the Near North Side. The community area, itself, is located north and east of the Chicago River. To its east is Lake Michigan and its northern boundary is the 19th-century city limit of Chicago, North Avenue. In comparison to the other downtown community areas, the Near North Side has the second largest total area, after the Near West Side, and the highest skyscraper and population count. With the exception of Goose Island and Cabrini–Green on the west, the Near North Side is known for its extreme affluence, typified by the Magnificent Mile, Gold Coast, Navy Pier, and its famous skyscrapers. McCormickville, in the vicinity of Rush and Erie Street, is so named because it is here where many branches of the famous McCormick family of mechanical reaper fame built their mansions in the late 19th and early 20th centuries. The Gold Coast consists mostly of high-rise apartment buildings on Lake Shore Drive, facing Lake Michigan, but also includes low-rise residential blocks, inland. As with many neighborhoods, its exact borders are subject to dispute; but, generally they extend from North Avenue, south, to Division Street and west to LaSalle Street; and, it also includes the areas east of State Street, south, to Oak Street and east of Michigan Avenue, south, to Oak Street. The Gold Coast became the home of the super-rich in 1885, when Potter Palmer, former dry goods merchant and owner of the Palmer House hotel, built a fanciful castle on Lake Shore Drive. Over the next few decades, Chicago’s elite gradually migrated from Prairie Avenue to their new homes north of the Loop. Along almost every boulevard of the Gold Coast, upscale boutiques and shops have opened up. Giorgio Armani, Chanel, Hermès, Gucci, Prada, Louis Vuitton, Cartier SA, Van Cleef & Arpels, Yves Saint Laurent, Harry Winston, Kate Spade, Tory Burch, DKNY, Ralph Lauren, Marc Jacobs, Stuart Weitzman, Rolex, Max Mara, Vera Wang, Jimmy Choo, Versace, Paul Stuart, Betsey Johnson, and Lilly Pulitzer are just a few of the dozens of designers that have locations in the exclusive neighborhood. Also, Lamborghini, Ferrari, Bentley, Porsche, and Bugatti have dealership locations in the Gold Coast. The “Gold Coast Historic District” was listed on the National Register of Historic Places on January 30, 1978. Gold Coast is zoned to the following Chicago Public Schools schools: Ogden School, and Lincoln Park High School. Old Town is a neighborhood in Chicago, Illinois, bounded by the North Avenue on north, Larrabee Street on the northwest, Division Street on the south, Clybourn Avenue on the southwest and LaSalle Street on the east. It crosses portions of the community areas of southern Lincoln Park, as well the northern Near North Side, and is part of Chicago’s 43rd ward. Old Town includes the Old Town Triangle Historic District. The Old Town Triangle Historic District is bounded on its northwest side by the former Ogden Avenue right-of-way, its northeast side by Lincoln Avenue and Wells Street, and on its south side by North Avenue. This historic district sits within the Old Town Triangle Association (OTTA), a Lincoln Park neighborhood bounded by the former Ogden Avenue right-of-way, Clark Street and North Avenue. It sits inside the community area of Lincoln Park and is part of Chicago’s 43rd ward. Old Town north of North Avenue is in Lincoln Park, and south of North Avenue is part of the Near North Side. It is now an affluent gentrified neighborhood. Old Town is today considered an affluent and historic neighborhood, home to many of Chicago’s older Victorian-era buildings.In the 1950s, the majority of this area was an enclave to the first Puerto Ricans to emigrate to Chicago. They referred to this area as part of “La Clark” until commercialization decorated late 1960s shop signs with the name of Old Town. The neighborhood is home to St. Michael’s Church, originally a Bavarian-built church, and one of 7 to survive the path of the Great Chicago Fire. St. Michael’s, Holy Name Cathedral, Immaculate Conception and St. Joseph’s catered also to Latinos with Spanish speaking masses. The neighborhood is also home to the famed The Second City improvisational comedy troupe. Many of the streets and alleys, particularly in the Old Town Triangle section, predate the Great Chicago Fire and do not all adhere to a typical Chicago grid pattern. In 1927, sculptors Sol Kogen and Edgar Miller purchased and subsequently rehabilited a house on Burton Place, near Wells Street, into the Carl Street Studios. Through the 1930s, an art colony emerged in the neighborhood as artists moved from the Towertown neighborhood near Washington Square Park. Old Town was also home to many gays and lesbians from the 1950s through the 1980s. There were numerous gay bars lining Wells Street (all of them closed now). This was the first “gay ghetto” in Chicago, predating the current Lake View neighborhood (which is the current epicentre of gay life). As the area gentrified, the gays moved further north to Lincoln Park and then Lake View neighborhoods. Goose Island is the only island on the Chicago River. It is separated from the mainland by the North Branch of the Chicago River on the west and the North Branch Canal on the east. The canal was dug in 1853 by former Chicago mayor William Butler Ogden for industrial purposes, thus forming the island. Because he formed the island, at times, it has been known as William B. Ogden Island. After Irish immigrants moved to the island, it took on the name Goose Island as well as Kilgubbin, which was the immigrants’ original home in Ireland. The Goose Island Brewery makes Kilgubbin Red Ale, in honor of this name. The River North neighborhood got its name from Chicago real estate developer Albert Friedman (chief executive of Friedman Properties Ltd.), who in 1974 started to buy, restore and build commercial property in the southeast sector. Much of the area was skid row at the time, so in an effort to attract tenants Friedman started calling the area “River North”. Within a few years, Friedman found photographers, ad agencies and art galleries willing to rent the low cost space and coalesce into what is now the The River North Gallery District, which has the largest concentration of art galleries in the United States outside of Manhattan. Along with hundreds of art galleries, the area holds many bars, dance clubs, popular restaurants, and entertainment venues. Between the year 2000 and 2010, the population in the four census tracts covering River North increased by an average of nearly 82%, boosting population from 9,835 in 2000 to 17,892 in 2010.
a theme-restaurant area with many tourist-oriented restaurants, surrounding Clark and Ontario; “the Cathedral District”, an area with many new residential skyscrapers surrounding Holy Name Cathedral (Catholic) and St. James Cathedral (Episcopal), located near State and Superior, and Huron and Wabash, respectively; a design district, with shops and showrooms selling commercial and luxury interior furnishings, in the blocks north of the Merchandise Mart; and Kingsbury Park, an area of newly built residential high-rises surrounding Montgomery Ward Park, at Erie Street and the Chicago River. Streeterville is the easternmost neighborhood in Chicago, north of the Chicago River. It is bounded by the river on the south, Michigan Avenue on the west, and Lake Michigan on the north and east. Streeterville houses some of Chicago’s tallest skyscrapers (such as the John Hancock Center) and most upscale stores, hotels, restaurants, as well as Northwestern Memorial Hospital and Northwestern University’s Feinberg School of Medicine, School of Continuing Studies, Kellogg School of Management’s downtown campus and School of Law. The Magnificent Mile portion of Michigan Avenue is part of Streeterville, as is the number one tourist attraction in Chicago, Navy Pier. The Museum of Contemporary Art, Chicago is also located here. 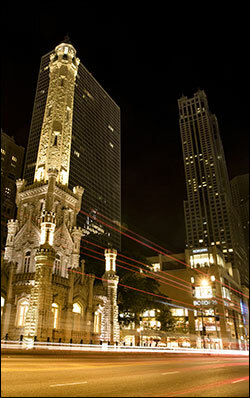 The Magnificent Mile is a stretch of North Michigan Avenue between the Chicago River and Oak Street in Streeterville. Although actually about three-quarters of a mile, the name “Magnificent Mile” has stuck. Along this street is a mixture of luxury stores, restaurants, office buildings and hotels. The area has a high concentration of the city’s major media firms and advertising agencies, including the Chicago Tribune newspaper. It is the home of Chicago’s famous Water Tower landmark, Water Tower Park with its historic clock, and the eight-level Water Tower Place shopping center which grew up next door to, and overshadowed, the comparatively diminutive landmark. The shopping center is anchored by Macy’s North Michigan store. North of the shopping center can be found the famous John Hancock Center, the Art Deco Palmolive Building and the lavish Drake Hotel. The name SoNo refers to the area being “SOuth of NOrth (Avenue)”. The SoNo neighborhood is bordered by North Avenue, Halsted Street, the North Branch of the Chicago River, and Division Street. It includes the British School of Chicago, Chicago’s largest auto dealership, the world’s third largest Whole Foods, the word’s first Kids Science Labs, and some high rise housing. It is also home to the Weed Street District. This is a rapidly changing area with more and more retail going up as an extension of the big box stores on Clybourn Avenue and North Avenue. Old Town has one Brown-Purple Line El station at 1536-40 North Sedgwick Avenue. It is one of the oldest standing stations on the ‘L’. River North is serviced by four “L” train stations: the above-ground Chicago-Brown and Merchandise Mart-Brown stations and the below-ground Chicago-Red and Grand-Red stations.